The Hip Hinge together with the Squat are two of the most fundamental and primal exercises in existence. There is quite a bit of material on the Squat, but the Hip Hinge is mostly overlooked other than in books covering Deadlifts. Here at Cavemantraining we changed that, behold, the precursor to Deadlifting, Bent-Over Rows, CrossFit Barbell Cleans and Kettlebell Swing is here. Part of the Kettlebell Training series to get anyone familiar with the intricacies of training with kettlebells. 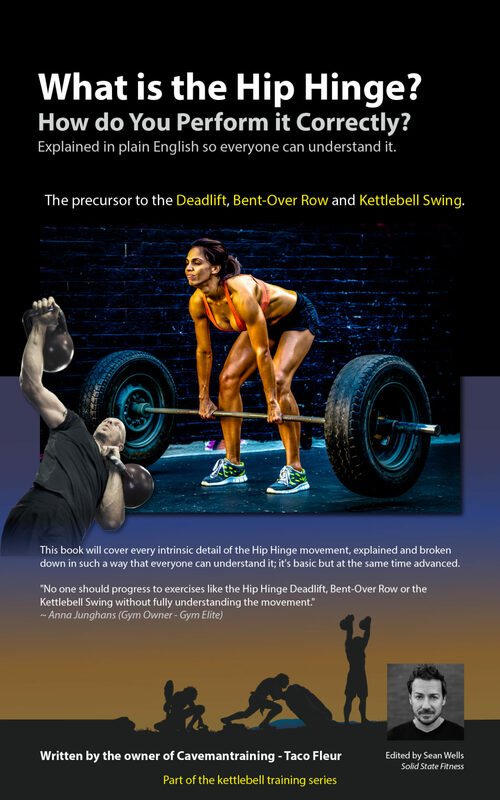 Even if you’re not into Kettlebell Training, this book is valuable for anyone who Deadlifts or performs Bent-Over Rows, it’s for Personal Trainers but also for the at home exercise enthusiasts. The book is available on Cavemantraining as Ebook Edition, on Amazon as Kindle and Paperback Edition. The book covers extremely important details that explain “using the back for lifting”, how to prevent doing so, the muscles involved, variations of the Hip Hinge, definition of the Hip Hinge, trainer cues, how to make corrections, drills to understand and teach the movement plus everything else that is important to know about the Hip Hinge movement. Following is an excerpt of the book. What does it mean to lift with your back? It’s hard to understand what lifting with your back means without proper explanation, I’m going to break it down for you and provide the information to understand exactly why your back can hurt after hip hinging, whether for deadlifts, rows or kettlebell swings. First you need to understand the muscles involved, I’ve listed all of them previously, but I’m going to recap for the explanation of lower-back pain. Read more. What exactly is the definition of the Hip Hinge, how do you know when you’re hip hinging or squatting? To be able to make sound judgements you need to understand the definition of the exercise first, the book covers the definition in details, but we’ve published some of the information on our website. Our Cavemantraining community members already get free access to more content than is publicly available, but they also receive a 20% discount on purchase of the book from our website. So if you’re not a free community member yet, what’s stopping you? Register here. Make sure you come back here once registered and signed in. Those who are already signed in, you should be able to see the coupon code to claim your discount, just use the code upon check-out. The book can be purchased here. Remember, the discount only applies when purchasing on Cavemantraining, not Amazon or any other vendor.